Handbags have become a big statement accessory for women... Sometimes for status and other times for fashion savvy. We tend to have multiple handbags for different occasions and outfits, from clutches to totes. The problem is we either carry too much or too little in our bags. Today's post which is sponsored by U by Kotex with Kleenex at Walmart is to help you strike a balance and have the right things for the just-in-case moments. I have narrowed them down to a top 5 must have handbag essentials for your handbag, and you can find them all at your local Walmart. Besides the cute packaging, U by Kotex Click tampons are really small and compact. I love that they are free of artificial scents and fragrances, go from compact to full size in one easy move, and insert easily. It also fits easily and discreetly in your handbag , a clutch or purse as opposed to its other counterparts. Get your pack of FREE Kleenex Slim Packs facial tissue as a bonus with your purchase of a pack of U by Kotex pad s or tampons. The offer is for a limited time only exclusively at Walmart. These Kleenex Slim Packs work great for absorbing the excess oil from my face leaving my makeup in tact, and is perfect for flu and cold season. My breath's best friend on-the-go. Altoids Small is all the mint flavor you will need in a small tablet, and it will save you from some really embarrassing moments when you speak to someone. The compact is the perfect size for your handbag, purse or wallet. Purell Gel Hand Sanitizer (2 oz) fits easily in my smaller bags and is a quick way to clean and sanitize hands on the go. It helps to keep the germs at bay when soap and water isn't accessible. And if you are a mommy like me you'll certainly don't want to leave home without it. I am literally married to my Samsung Galaxy S3. I would never leave home without it - from keeping up with social media, to jotting down my blog post ideas in my Evernote, to checking and responding to emails. My cell phone is literally my office on the go. So if you are a Walmart regular like I am, you'll want to check out the U by Kotex special packages with a bonus Kleenex Slim Pack. And as an added incentive, there is also the Share and Save opportunity, where the more times you share on Twitter, Pinterest, or Facebook, the higher the coupon value. The offer includes three coupons for Kleenex ($0.50, $0.75, $1) and three for U by Kotex ($0.75, $1, $1.50). 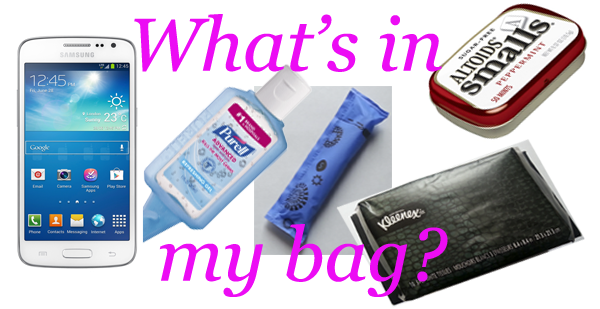 What's in your handbag? Are you prepared for the just-in-case moments? Thanks to U by Kotex and Walmart for sponsoring this post. All thoughts and opinions are my own.